This is the second version I've seen of this particular sampler: I blogged about the first one here. Or this may be the same sampler, reauctioned, as both have AMP 1936 on them, likely the initials of the maker. Design area is 14inches x 18inches. This one is very particularly about Edward and the abdication: it might seem almost disloyal to be celebrating the king who left the throne rather than focusing on the king who took on the job, but in the public view (with the press barons censoring/editing coverage of Edward VIII's wilder/less wise moments) he was an heroic figure, and his abdication a loss. Sylvia over at Linens and Royals bought this one - read her blog entry here. She says it's a Royal School of Needlework design, original price 7/6. 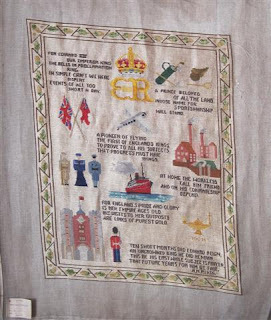 I still like the sense of the modern age in this sampler - industry, sport etc as well as traditional Union Jacks and guardsmen. And the ?prescient inclusion of the three military figures representing army, navy and air force, with WW2 only two years in the future. If you know any more about this design, please do leave a comment so it can be shared with others.